As some of you may already know, we are currently working on our first core game, and we’re giving our colleagues plenty of opportunities to develop their skills! Not only will this quench their thirst for knowledge, but it will also allow us to create the best possible product for our players. 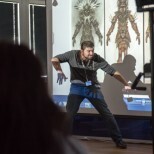 We were lucky enough to welcome an extraordinarily talented artist to give a series of workshops in our company: Trent Kaniuga is a concept and environment artist for world-renowned computer games. He has worked on titles such as World of Warcraft and Diablo 3. Trent began drawing at the age of 14, and at the age of 16 he released his first successful comic, “Creed”. He gave us all the inside info and some insight into the design processes of a AAA studio. Colleagues from all of our art teams took part in Trent’s workshops, learned his conceptual approach, and marveled at the work he produced during an introductory presentation. Many of the participants recognized his work and were proud to learn from the “father” of these landscapes and characters. 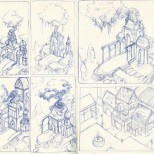 The first workshop covered environment art, i.e. 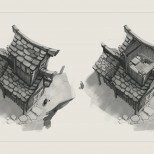 designing the environment in which the landscapes, buildings, or items appear. The theme of the day was the lost city of Atlantis. Trent explained to the participants how he organizes the design process, emphasizing that brainstorming and intensive research about design language, for example the architecture, are the most important fundamental elements. In order to then create an object in the landscape, Trent chose a photo and used it as a basis for an overpaint, meaning that he painted over the picture and thus carried over the perspectives for the further process. 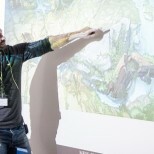 During Trent’s presentation, the participants also kept themselves busy by creating sketches of Atlantis. Although just rough sketches, to the layman, they already looked rather artistic and sophisticated. 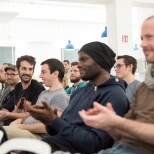 The second workshop focused on the design process for creating a game character. A figure from the age of steampunk, where modern and futuristic technical functions are linked with materials from the Victorian ages, was used as an example. Characters are given their coloring using gradient maps in Photoshop. While implementing the design, it is important to consider the logic of small elements. For example, the character carries a weapon in a holster and both of the objects need to work together. Once again, research is absolutely essential, as the accessories need to look like they come from that period. On the last day of Trent’s visit, our colleagues had the opportunity to ask him questions and get specific tips for their current projects. All the participants were delighted with the workshops, since Trent isn’t just a master in his field, but also a really nice guy – he quickly captured all of our colleagues’ imaginations. Everyone returned to their work with new ideas of how to design the most varied landscapes and detailed characters to provide you with the most enjoyable game play for our new core game!